Did you know "American Pickers" star Mike Wolfe got his start digging bottles when he was just a kid? He's in good company. Collectors from all walks of life enjoy this pastime for fun and profit. But when it comes to valuing antique and collectible examples, there many varied factors to consider. One great resource is Antique Trader Bottles Identification and Price Guide (Krause Publications) by Michael Polak. This bottle expert, who has collected more than 3,000 varied examples, also shared in an Antique Trader magazine article that there are several general factors, which are elaborated upon in his book, that must be considered when pricing bottles. Those key points are: color, condition, and rarity. 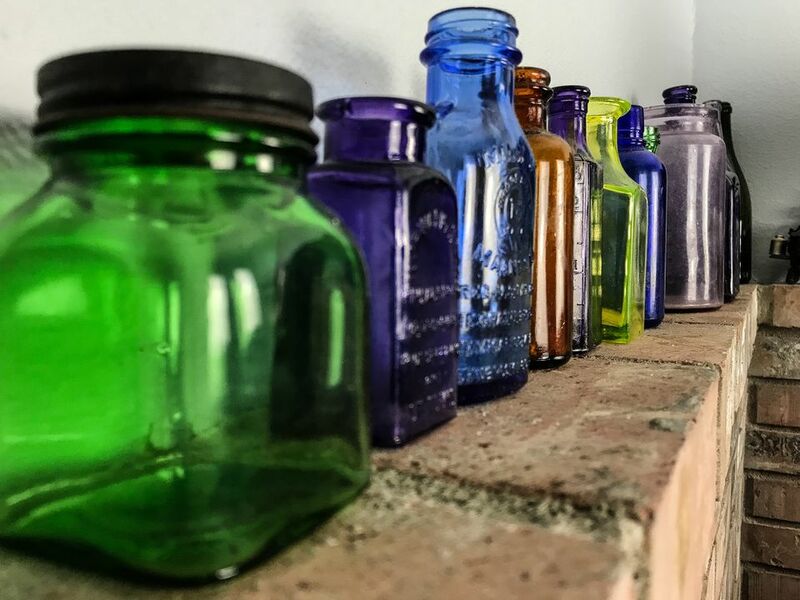 Perhaps because glass color is the most immediate thing collectors notice about an old bottle, they often proclaim that “color is king." Rare colors do elevate the value of most any type of bottle, according to Polak. He ranks the following colors in the low to medium range, generally: clear, aqua, basic amber, milk glass, green, black, and dark olive green. As the colors become more unusual, the values often start to rise. More uncommon colors include: teal blue, cobalt blue (in some instances), emerald green, purple (also known as amethyst), straw yellow, puce, yellow amber, deep blue-green, teal green, sapphire blue, and cornflower blue along with others. What this equates to is that the same bottle in clear glass compared to one in a rare color like teal blue could have a difference in value of several thousand dollars at auction. It is imperative that you look at comparables of the same bottle type in the same exact color when determining value. Don’t let yourself fall into the “one just like mine" trap if they really aren’t exactly alike in terms of style, color, and condition. Mint – This means there is no damage to the bottle whatsoever. “Must be clean with vibrant unique color, no chips, cracks, scrapes, or wear of any type.” Flaws, no matter how minor, downgrade the bottle in value. Extra Fine/Near Mint – This level might exhibit very slight wear to embossing or a label that is still present. These types of flaws are nearly undetectable such as a light rub spot from case wear, or a very light stain. In other words, a bottle very close to mint with very little wrong with it. Very Good/Excellent – A label may have wear or be missing at this level, or perhaps the embossing with have a bit of wear. Nicks (known as fleabites in the business) in the glass would still be very, very minor and any rubs are very light. Glass color must be excellent as well, with no cloudiness. Good – While still completely intact, a bottle of this grade shows overall wear. May have minor scrapes or chips. Wear is easily seen without close inspection. Fair or Average – This grade defines a bottle with “considerable wear.” The label will be missing or embossing damaged. Wear is very readily apparent. Poor or Damaged – The presence of chips, cracks, major rubs, and/or severe stains overall. It’s good, first off, to remember that the amount of damage a collector will tolerate when it comes to an old bottle goes hand and hand with how hard that example is to hunt down. Polak mentions seven grades of rarity in his book ranging from “unique” to “common.” A unique bottle, one where only one is known to exist, would be more acceptable with damage and still bring a high sum, but if it’s pristine the price really goes up. Common bottles, on the other hand, need to be in top condition to bring top dollar and the value won't be nearly as high even then. “Extremely rare” bottles have only five to 10 known examples, while “very rare” will have 10 to 20 known examples and “rare” means there are 20 to 40 examples known to exist in collections. The term “scarce” is used for 100 bottles in existence, while “very scarce” references 50 known examples. Common bottles, according to Polak, include those that are “abundant and easy to acquire.” Clear medicine bottles form the late 1800s along with certain beer bottles or whiskey vessels in readily available colors, for example, fall into this category. These are usually bottles beginners focus on, and again, they need to be in mint or near mint condition to retain the most value. Collectors learn as they go along that a number of different factors go into grading and valuing bottles. Studying a book like Polak’s is a great place to start, but it takes years of hands on experience to be able to evaluate rare bottles without further guidance. Don’t be afraid to ask a more experienced bottle collector or dealer for help. This is especially true if you have something you think is out of the ordinary. “There are also a number of unique features or characteristics that can significantly affect value such as pontil marks found on blown glass, whittle marks, type of molds, glass imperfections, slug plates, variations of lips or tops and the glass house location where the bottle was manufactured,” Polak wrote for Antique Trader. These are all advanced nuances that may add value to a variety of different kinds of bottles, and you learn to pick up on them over time.